Cannabis legalization in Washington State can sometimes feel like old news. But for Spokane Green Leaf co-founders, Todd and Kirk, that glorious, frantic time still feels like it was yesterday. 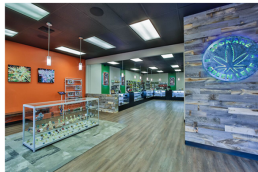 Before they opened their doors on July 8th in 2014, Kirk and Todd thought that opening one of the first recreational cannabis shops in Washington was just a cool idea and a fun way to make a little history. They’d get a few customers, have a few laughs, and meet some new friends. Neither one of them had any idea that their decision to pursue this dream would dramatically change their lives forever. It all began at a Halloween party. The two had bonded over their sons’ shared love of soccer over the course of a few youth soccer seasons. They were friends, but Kirk had no idea that sandwiched between costumes and candy, Todd, the mild-mannered environmental engineer, was about to suggest a partnership that was going to set their lives on a dramatically different path. Of course, it wasn’t that simple, even after winning the lottery to get one of the few coveted licenses, there was still the matter of finding a building willing to take a chance on them and navigating the byzantine labyrinth of regulations the state put forward for people seeking licenses. Not to mention, they both had full-time jobs. Slowly but surely, every piece started to click into place, Kirk found the building that would house their first store, and Todd’s background as an environmental engineer made him well-equipped to tackle the extensive codes and regulations. At night after their day jobs and on weekends, they worked feverishly to make their dreams a reality; they wanted to be first. First in Spokane, first in Eastern Washington and first in the State. And they were. After receiving one of the very first retail licenses in the state, they were the first cannabis shop to open its doors in Eastern Washington. Todd, Kirk, and the rest of the Spokane Green Leaf crew would love to help you live your cannabis dream. Stop in soon to experience Spokane’s original cannabis shop. We look forward to seeing you.